Proper digestion requires both a gastric phase supplying hydrochloric acid and pepsin, and an alkaline duodenal phase supplying protease, amylase, and lipase enzymes. DuoZyme provides all of these factors in a single, convenient, high potency capsule delivery system. 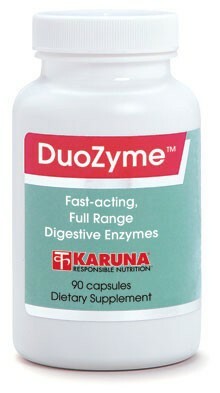 DuoZyme utilizes the technologically superior enzyme-release system which was favorably evaluated by Dr. David Graham in An Enteric-Coated Pancreatic Enzyme Preparation That Works (Dig Dis Sci 1979;24:906-9). DuoZyme contains the acidulants betaine HCl and glutamic HCl, which help acidify gastric contents, creating a favorable environment for the proteolytic action of pepsin. 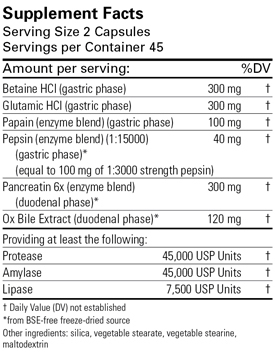 Pancreatin and ox bile extract, contained in pH-sensitive microspheres, supplement the natural secretions of the pancreas and liver, and promote the intestinal phase of digestion. pH-sensitive microspheres typically provide a more effective means for delivering intact enzymes to the small intestine to reduce malabsorption of macronutrients (Dig Dis Sci 1979; 24:906-9). Suggested use for adults: Two or more capsules, taken with meals, or as directed. Warning: patients with active peptic ulcer should use HCl products with caution.